OdorXit Eliminator - Eliminate Surface & Fabric Odors For Good! OdorXit Odor eliminator is guaranteed to remove the toughest odors. OdorXit Odor Eliminator is great for spoiled food odors from turned off refrigerators too. Add it to the laundry with your favorite detergent to handle all kinds of clothing odors — including those caused by incontinence. 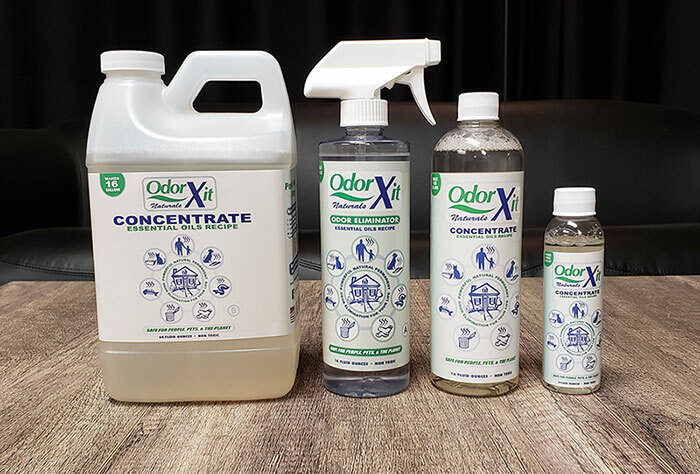 OdorXit Odor Eliminator is a blend of non-staining, non-toxic, biodegradable water and essential oils that neutralize the source of most organic and many inorganic odors. OdorXit Odor Eliminator comes Ready-To-Use or in Concentrate. Concentrate just needs to be mixed with water to be ready-to-use. Mix 1 part concentrate to 4 parts water.